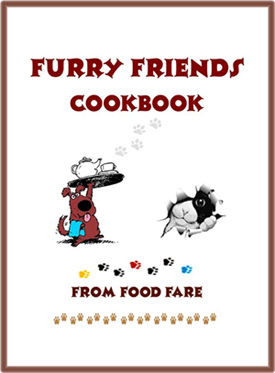 The Furry Friends Cookbook contains more than 60 original recipes for homemade dog and cat food, including main meals, treats, biscuits and kibble. 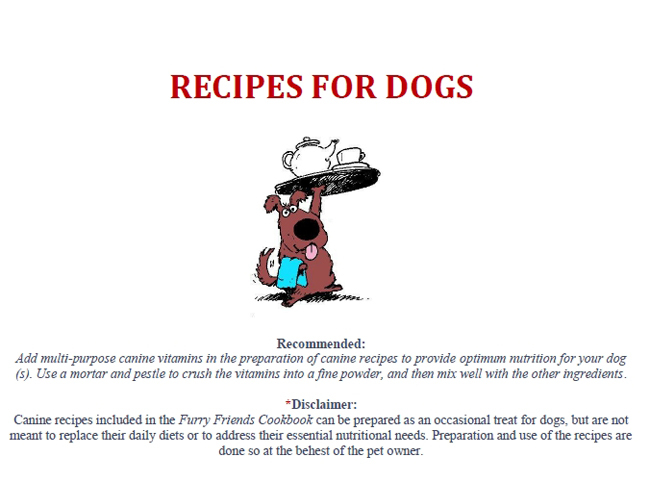 The recipes in the Furry Friends Cookbook can be prepared as occasional treats for dogs and cats but are not meant to replace their daily diets or to address their essential nutritional needs. Try serving home-cooked meals once a week as an alternate to commercially prepared pet food. Recommended for all recipes: Add multi-purpose canine and feline vitamins in the preparation of recipes to provide optimum nutrition for your pet (s). 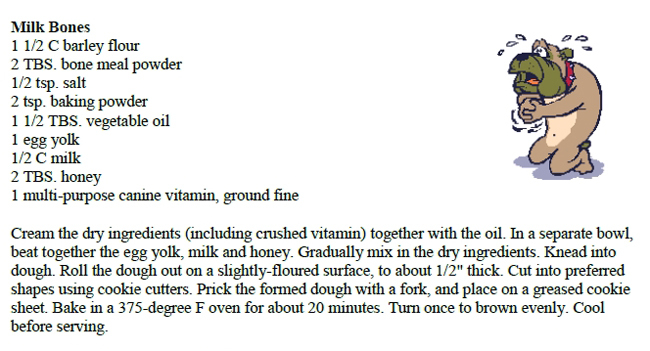 Use a mortar and pestle to crush the vitamins into a fine powder, and then mix well with the other ingredients. 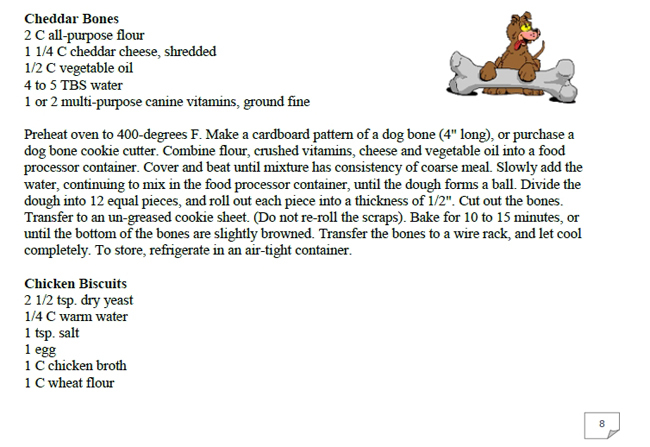 To see a complete list of recipes in the Furry Friends Cookbook, click here (PDF, 326 KB). 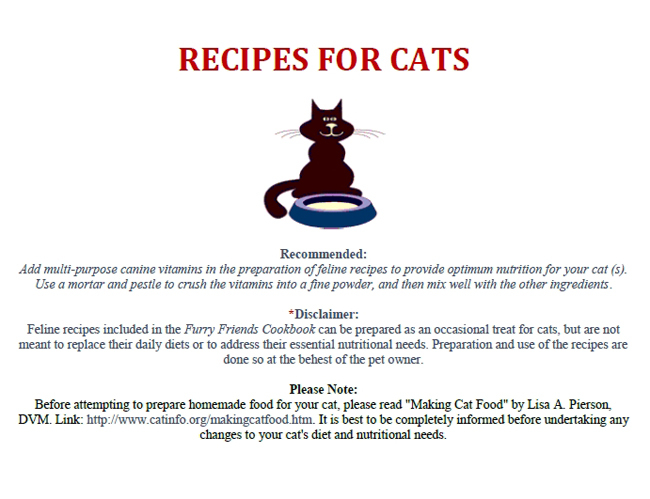 *Disclaimer: Preparation and use of recipes contained in the Furry Friends Cookbook are done so at the behest of the pet owner. 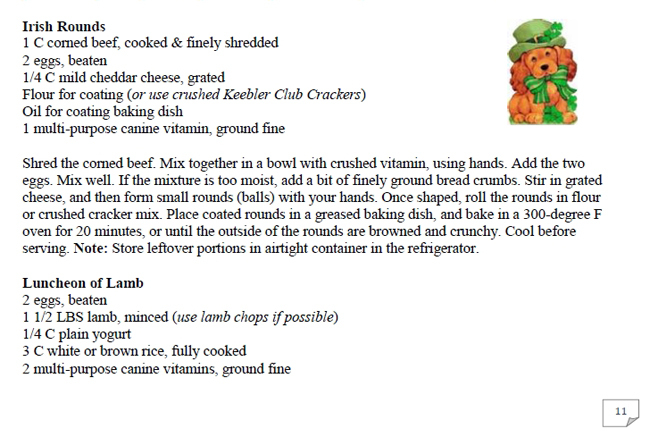 To take a look inside the Furry Friends Cookbook, select from the screenshots below. Click on images to see their larger sizes in a new window. 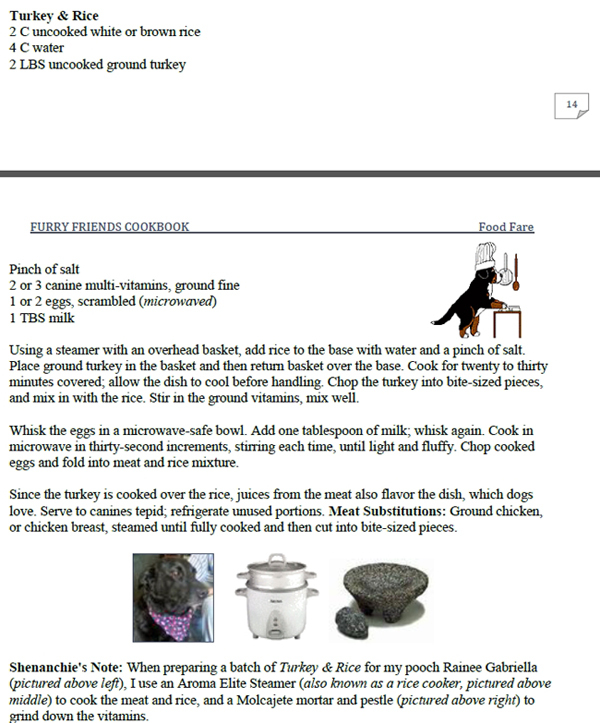 The Furry Friends Cookbook in PDF format has 29 pages and is 490 KB in size. 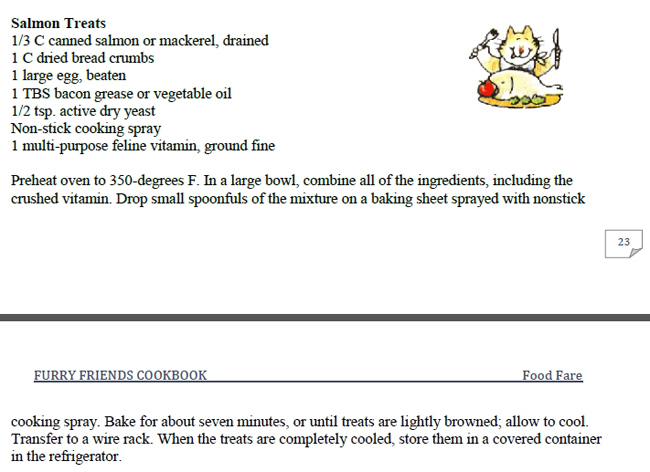 In order to open and use the Furry Friends Cookbook, the purchaser must have Adobe Acrobat Reader. 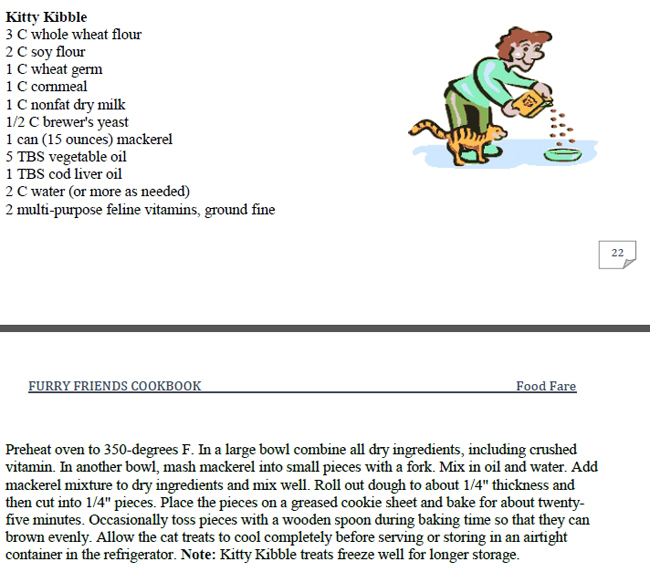 FAQ: The slight increase in price for the PDF version of the Furry Friends Cookbook is due to the larger size of the book, and that it contains all graphics and a recipe index with page locations. Kindle Edition > $1.25, ASIN: B00AWDSX4K. Kobo Edition > $1.25, ISBN: 1230000096070; multiple formats (Kobo-Vox, Smartphone & tablet). Barnes & Noble/Nook Edition > $1.25, ISBN/BNID: 2940016166810. PDF (Adobe Acrobat, see above) Edition: $2.25, File Size (490 KB); 29 pages; photos and recipe index included.